We are excited to announce the winner of our #GeorgiaSpring Photo Contest with Atlanta Trails. Contestants were challenged to show off their best Georgia spring photos via Instagram and Twitter. We got a bad case of spring fever looking at all the entries. 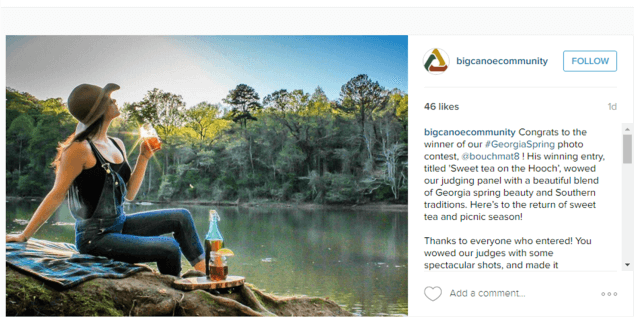 Ultimately, we had to choose one winner and it was Matt Boucher’s photo of sweet tea sipping on the Chattahoochee River. Living in Atlanta, Mr. Boucher is an outdoor enthusiast and enjoys photography as a recently new hobby. Mr. Boucher and his guests won an adventure-packed three day, two night stay in Big Canoe Community, the 2015 Hiking Community of the Year, on June 3-5, 2016. They will be able to enjoy gorgeous views of Amicalola Falls, go on a pontoon boat ride,and take a triple waterfall hike with the Atlanta Trails crew on Big Canoe’s 20+ mile trail network. During their three day stay, they will soak up some incredible North Georgia mountain beauty in Big Canoe’s gated 8,000 acres filled with trails, mountains, meadows, lakes and waterfalls, located just over an hour from Atlanta.